Image caption Volunteers from Tennessee, Mississippi, Ohio and Texas fought in the Battle of Monterey which lasted three days in 1846. The remains of 10 US soldiers killed during the Mexican-American war are being returned 170 years after their deaths. 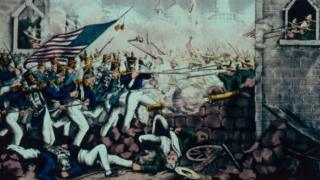 The troops are believed to have been volunteers who fought during the Battle of Monterrey in Mexico in 1846. The battle was key in a two-year war which led to the annexation by the US of a large area of territory. The bones are being flown to a US Air Force base in Delaware and will be handed over to scientists for study. The base is home to a military mortuary. Forensic anthropologists hope to determine where the soldiers were from and how they died. The remains were found during building works in the northern Mexican city of Monterrey in 2011. Excavations began in 1995. and these finds were made in the same area where another set of remains had been discovered. Archaeologists said the shape of the skulls and the bone measurements suggested they belonged to Americans. Artefacts found nearby included two half-dollar US coins. The Mexican-American War lasted from 1846 to 1848 and led to Mexico losing half of its territory which later became Arizona, California, Colorado, Nevada, New Mexico, Utah and Wyoming.